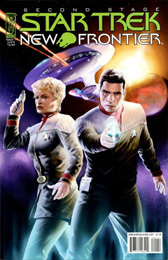 The most dangerous experimental vessel in the galaxy — a prototype time ship — has vanished and it appears that the man who stole it is none other than the Starfleet Admiral Edward Jelico. 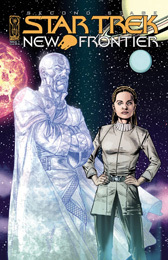 Only Mackenzie Calhoun and the crew of Excalibur have a hope in finding him before the ship, intended purely for scientific exploration, is used to disrupt the space-time continuum! 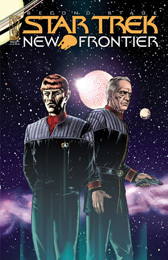 Peter David, the handpicked creator of the first Star Trek crew designed exclusively for print, accompanied here by artist Stephen Thompson, celebrates the 10th anniversary of the New Frontier with this comic book series, showcasing all-new stories and the official continuation of the hit novels. 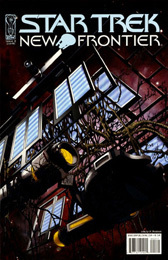 With art by Stephen Thompson (Beneath the Valley of Rage), who also delivers four painted covers available as a Quad Cover, all bound in the same issue. 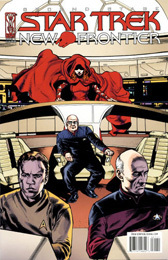 Thompson also provides a bonus incentive cover for issue 1 featuring Starfleet Captain Peter David in the command chair! 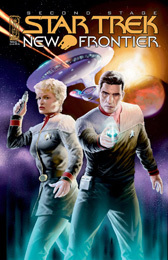 Slingshot, the most dangerous experimental vessel in the galaxy - a prototype time ship - has vanished, and it appears that the man who stole it is none other than Starfleet Admiral Edward Jellico. 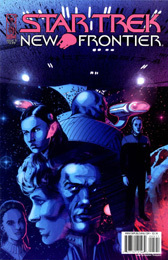 Only Mackenzie Calhoun and the crew of the Excalibur have a hope in finding him before the ship, intended purely for scientific exploration, is used to disrupt the space-time continuum. 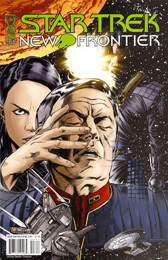 Admiral Jellico steals a prototype time ship… or does he? Not everything is what it seems. 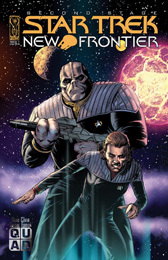 Nothing in the previous issues has been what it seemed as the true hijacker of the Paradox stands revealed, and Captain Calhoun finds himself face-to-face with the mastermind behind the entire plot. 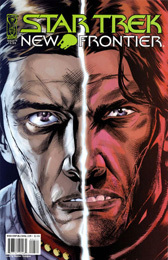 There are only two questions to be faced: Can he stop his opponent… and does he even want to? The final confrontation. 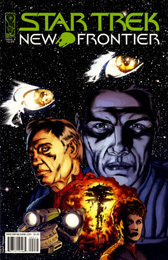 Outgunned, outmanned, but never outwitted, Mackenzie Calhoun and the crew of the Excalibur face off against the masterminds behind the theft of the Paradox while the fate of Bravo Station, and Calhoun's wife, Admiral Shelby, hang in the balance.